JNN 05 April 2014 Tehran : General Electric Company has said it has received permission from the US government to overhaul 18 engines sold to Iran in the late 1970s. General Electric spokesman Rick Kennedy said on Friday that the US Treasury Department had approved the company’s application to service the 18 engines at facilities owned by GE or Germany’s MTU Aero Engines, which is licensed to do the work under a temporary sanctions relief deal reached in January. Kennedy said GE officials would meet with officials from Iran flag carrier Iran Air and MTU in Istanbul in coming days to discuss Iran’s needs. Boeing Co, the world’s biggest airplane manufacturer, said it received a license this week from the US Treasury Department to export certain spare parts for commercial aircraft to Iran as part of sanctions relief agreement reached in January. A Boeing spokesman said on Friday that the company would now contact Iranian officials to determine which parts were needed, Reuters reported. 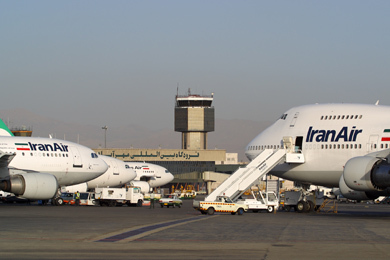 The executive said the license covered only components needed to ensure continued safe flight operations of older Boeing planes sold to Iran before the 1979 Islamic revolution. Reuters reported in February that both Boeing and General Electric Co. had applied for permission to export spare parts for Iranian aircraft during a six-month window agreed by the Islamic Republic and six world powers in November. Analysts say the move could help American firms to put themselves in a position to benefit if a broader softening of sanctions emerges from the talks. Iran and the five permanent members of the United Nations Security Council — Britain, China, France, Russia and the United States — plus Germany sealed the interim deal in Geneva on November 24 to pave the way for the full resolution of the West’s decade-old dispute with Iran over the country’s nuclear energy program. Tehran has repeatedly declared that its nuclear program is for peaceful objectives and the International Atomic Energy Agency (IAEA) has discovered nothing to prove any diversion in Iranian nuclear energy program, contrary to unverified claims by Western powers that Iran may be pursuing non-civilian aims as well. This entry was posted in Europe, Iran News, United States and tagged Boeing, GE, General Electric, General Electric Co., General Electric Company, iran, Iran Air, spare Parts. Bookmark the permalink.